Going out to a sports bar with friends is always a good time, but sharing can make for an even more enjoyable experience. When you order shareable menu options, it gives everyone a chance to try something different. At Buffalo Wild Wings®, there are always plenty of appetizers, sides, and samplers to go around. With several locations throughout Connecticut, including Danbury, New Haven, and Stamford, this beloved wings joint is the perfect place for friends to share any of the following plates. Boasting a unique flavor, this favorite appetizer will be the envy of everyone else at your table. Be a good friend and share your fried pickles with your fellow diners, and perhaps they’ll repay you with a zesty buffalo chip or mini corn dog. By nature, these are the perfect snacks to grab individually, so go ahead and share away. If your party is feeling adventurous, consider swapping the classic chips and salsa combo for chili queso dip, spinach artichoke dip, or the packed-to-the-brim platter of ultimate nachos. 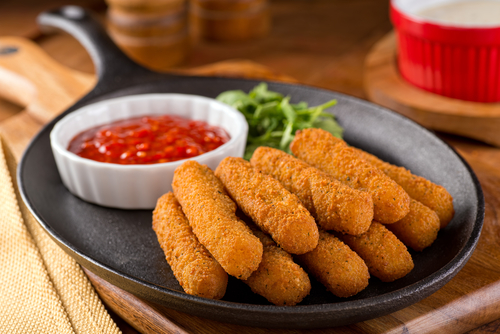 Something about mozzarella sticks gets appetites fired up like no other sports bar food. When everyone is feeling too hungry to wait for their main entrée, order at least one serving of these mouthwatering must-haves. Is there a more iconic sharing food than French fries? It’s almost impossible to resist sneaking a fry off a friend’s plate, so invite sharing from the get-go. Choose a side of fries as an appetizer or a shared side, and everyone will have access to the crispy golden snacks they crave. For the especially hungry crowd, quesadillas are a filling and delicious way to start off any meal. Choose between the chicken or smothered cheese steak quesadilla — or, if you can’t decide, order both and pass them around! Of course, with so many choices for sharing, you may find yourself unsure of where to even begin. When you simply can’t decide, consider ordering the house or all star samplers for a little bit of everything. Featuring some of the sports bar’s best snacks like mozzarella sticks, onion rings, and nachos, there’s something for everyone on these platters. To view their menu now, visit Buffalo Wild Wings online and call (203) 794-9453 today.